Below are some resources from the LRC aimed to help staff on their work on their Professional Learning Plans They of the following topics; Thinking and Metacognition, Digital Technology, Effective Assessments, Respectful Relationships/Empathy, Student Engagement, Transnationalism and Learning Environment. The items are hyperlinked to the catalogue by logging in there you can reserve the item if it is out or look at what else we have. The shelving for this years Professional Learning Resources is at the back of the LRC near the entrance to L1.01. Staff can review items they find useful for PLP (or anything else) by logging into the catalogue using their three letter staff code. For example "GUR" No PIN is needed, though if you would prefer one the LRC can arrange one for you. To add a review to something you have borrowed either search for the item and select write a review from under the cover image or go into your loan history, find the item and select write a review next to the item details. 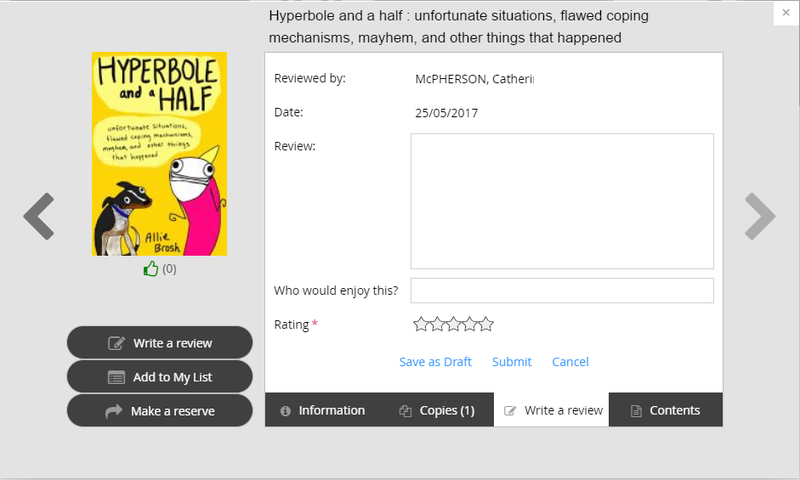 This is what you will see when you go in to write a review. Details can be filled in however you wish. 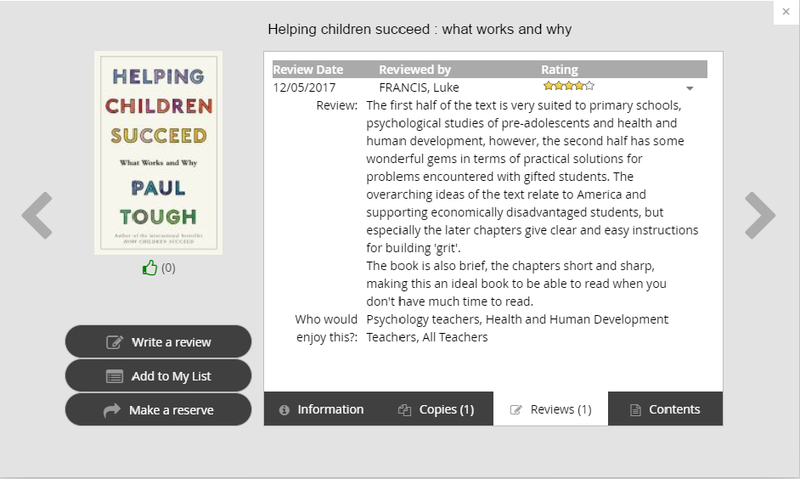 Reviews will be checked then become visible to the school community. 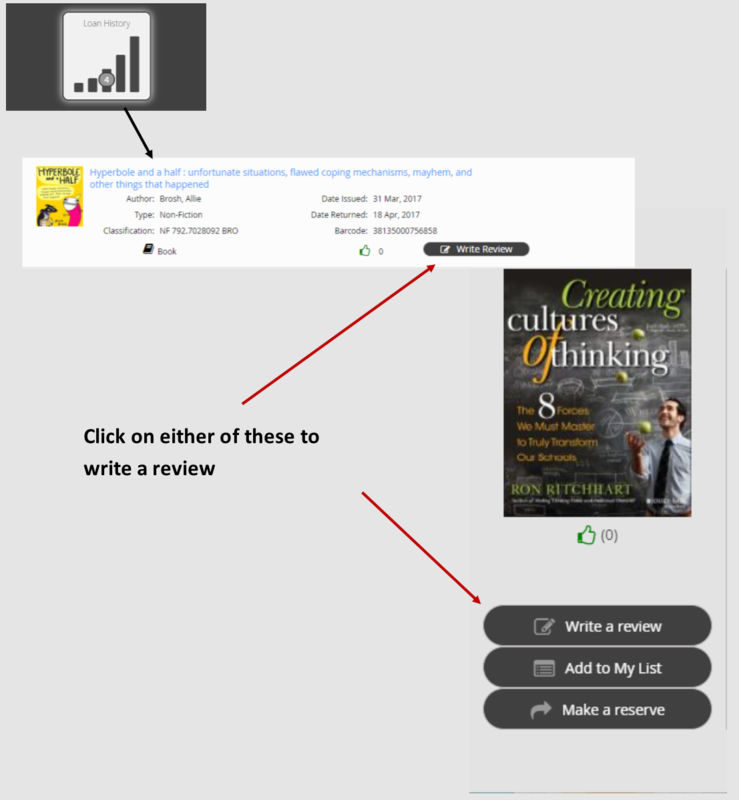 To access a review click on the reviews tab on the record of an item and click the down arrow to expand. Visible Learning for Mathematics, Grades K-12 by John A. (Allan) Hattie; Douglas B. Fisher et al. One of Gardner's five minds for the future is 'the respectful mind'. "Writing narratives about a socioscientific issue: Engaging students and learning science"
I found this article on EBSCO. It is a study on engaging students in the writing of hybridised scientific narratives-that is short stories that merge scientific information with narrative storylines. must be left outside in your locker. Mobile phones are to be kept on silent.